As seen from Cambridge , Venus will reach its highest point in the sky in its 2018–2019 morning apparition. It will be shining brightly at mag -4.4. From Cambridge, this apparition will not be one of the most prominent but nonetheless prominent, reaching a peak altitude of 32° above the horizon at sunrise on 14 Dec 2018. 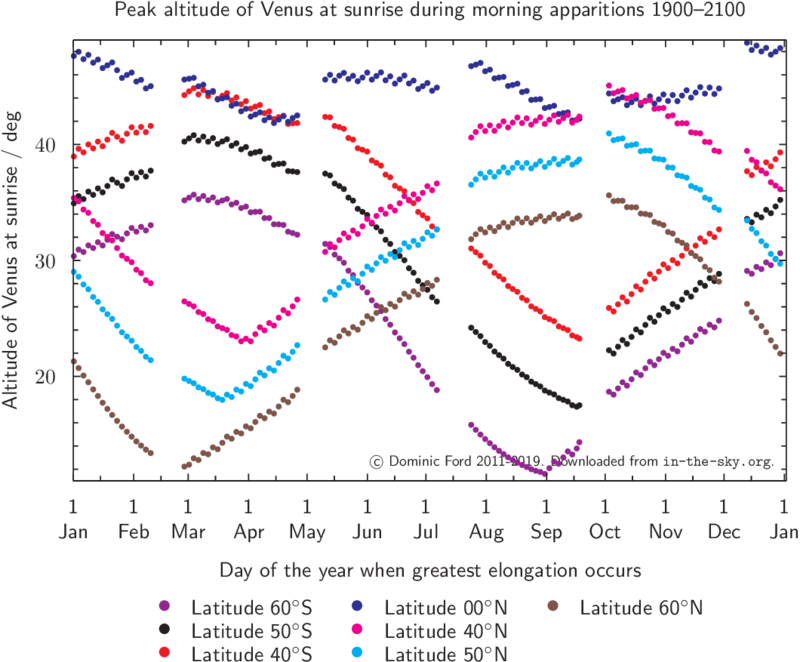 The table below lists how high above the horizon Venus will appear at sunrise over the course of its the apparition. All times are given in Cambridge local time. At each apparition, Venus reaches a maximum separation from the Sun of around 48°. However, some times of the year are more favourable for viewing Venus than others. From Cambridge, it reaches a maximum altitude of between 22° and 44° above the horizon at sunrise during each morning apparition, depending on the time of year. During its 2018–2019 apparition, it will peak at 32° above the horizon at sunrise on 14 Dec 2018. 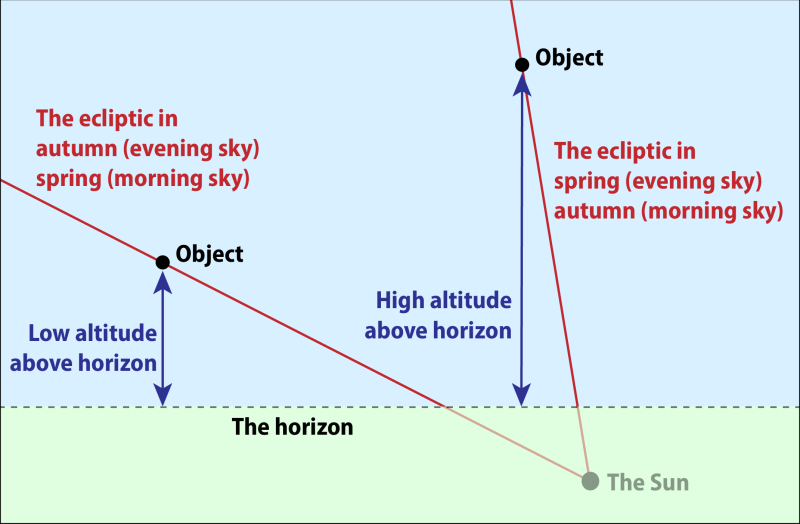 The inclination of the ecliptic plane to the horizon at Cambridge varies between 71° (sunrise at the autumn equinox) and 24° (sunrise at the spring equinox). On December 14, the ecliptic is inclined at 36° to the eastern dawn horizon, as shown by the yellow line in the planetarium above, meaning that this apparition of Venus will not be one of the most prominent but nonetheless prominent, reaching a peak altitude of 32° above the horizon at sunrise.